Click Here for Special Coupons and Savings! Your pet’s wellness is our number one concern. We advocate early detection and preventative care to give your pet the best quality and longest life possible. 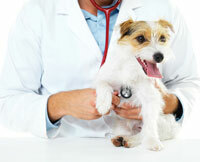 Whether your pet is young or old, annual exams are an important part of your pet’s healthcare. Dogs and cats age approximately 7 times faster than people (10 times faster for giant breed dogs). Therefore, routine check ups are extremely important because significant medical changes can occur in your pet over only a few months time. 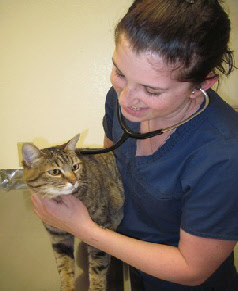 Annual checkups allow us to record your pet’s weight and vital signs when your pet is healthy. Routine check ups can detect problems early which can save your pet from needless suffering and save you from expensive treatments. Proper diet and exercise are just as important for your dog as they are for you. 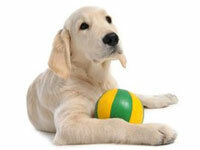 Even when you aren’t feeling energetic, you can exercise your dog by throwing the ball or similar games. If your dog is not a good retriever you can use a bucket of balls and pick them up when you have more energy. Don’t leave your dog alone with toys that can be chewed up and ingested. Cats can be kept active by chasing a laser light you run quickly around the floor. You can also use a feather or ball attached to a stick to encourage your cat to jump up and paw at it. 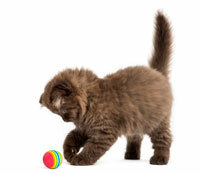 Be careful to put chewable toys away, after play, as cats can ingest string or feathers which could result in the need for surgery. Increased desire for water can be an early sign of several types of illnesses. If you have an automatic watering bowl, you might notice increased urination before you notice the increased desire for water. 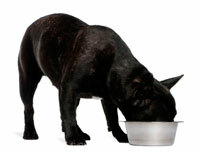 Monitor your pet’s food and water intake closely. Also, observe his urine and stool output. If you notice changes, please call our office right away for an appointment. Changes in your pet’s behavior, such as lethargy (laziness) or increased thirst can be signs of medical changes. If you notice any behavioral changes in your pet, you should make an appointment for a check up. You may think that your pet just has signs of “getting older”. However, many of these signs may indicate actual medical conditions that can be treated. 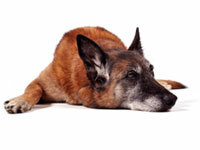 These treatments can significantly improve your senior pet’s quality of life. Pets feel pain just as we do, but they are unable to tell us how they feel. Don’t expect your pets to cry or stop eating if they are experiencing chronic pain. Hiding pain is a natural instinct for animals. 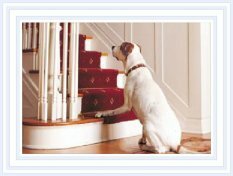 Slowness to get up or choosing not to go up stairs or jump up, may be signs of pain. There are several safe and effective pain relief medications now available to help alleviate pain and give our older pets a better quality of life.